TOP 4 AIR CONDITIONER TROUBLESHOOTING TIPS-TRY THESE FIRST! Air conditioning problems can be inconvenient and uncomfortable even on mild days in Southwest Florida, but in many cases, the cause may be simple, such as airflow problems from a dirty filter or a compressor that overheats on an especially hot day. 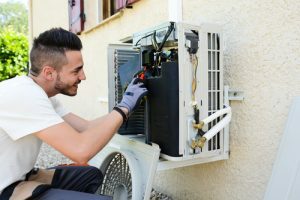 Before calling a professional, there are a few air conditioner troubleshooting tips that you should try first, possibly saving valuable time and money. When the air conditioner will not turn on, make sure that the thermostat is set correctly and that it has power, replacing the batteries if necessary. If the thermostat is working, check for tripped breakers, and reset them, even if they are not tripped. This will often reset the control systems or safety systems. If the compressor has an overheat safety switch, reset it, as well. Poor cooling performance or frozen coils could be the result of airflow problems. Check for a dirty air filter and replace it if necessary. Check all vents and ducts for obstructions, such as furniture or curtains that block the vents, or items that have fallen into floor ducts. If the problem remains, check the evaporator and blower fan for dust or dirt accumulations, and carefully clean them with the power off. Poor cooling performance can also be caused by a dirty condenser outside. Make sure the area around the condenser is free of debris, such as tall grass or lawn furniture. Check the condenser coil for debris, such as leaves and grass, and clean it with a garden hose, if necessary. Make sure the fan spins freely and operates properly. If you notice water leaking from the air conditioner or it will not turn on, make sure the condensate drain is clean. Some systems will shut down automatically if the drain is clogged. Use a shop vacuum or a thin wire to remove dirt and algae from the drain line. For more air conditioner troubleshooting tips, talk to our professionals at Conditioned Air today. We have been serving homeowners throughout Southwest Florida since 1962.